Added support for DJI drones in which the GPS data is embedded into movie file (in SRT format). It seems that DJI plays fast and lose with the SRT format. There are many variations of it. Fixed bug in which speedometer and compass could show wrong speed and direction if the Dashboard window was closed and reopened. 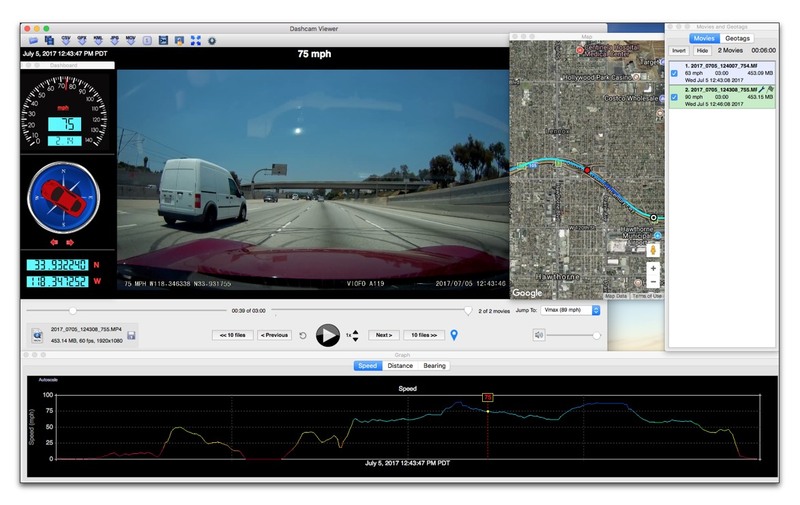 [Mac version] Fixed bug which would prevent Dashcam Viewer from running on pre-10.11 operating systems. The Graph window can now shrink to same height as Dashboard window. DJI SRT: Added initial support for DJI Matrice SRT file format. Note: the SRT file format has many variants and is a moving target which makes it difficult to fully support. [Mac version] Fixed bug in which directory selections for file import/export would not always stick. This was introduced in v2.7.0.